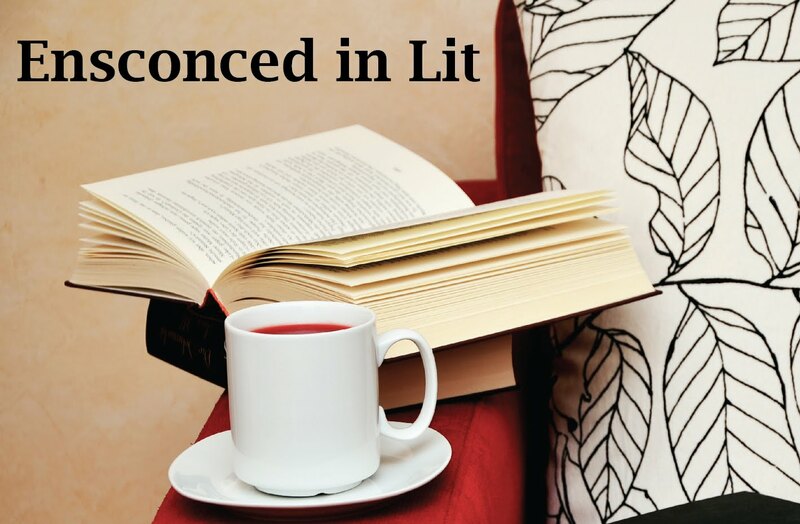 Ensconced in Lit: The Art of Lainey by Paula Stokes Info that you won't wanna miss! Twitter party, general mayhem, and GIVEAWAYS GALORE! The Art of Lainey by Paula Stokes Info that you won't wanna miss! Twitter party, general mayhem, and GIVEAWAYS GALORE! Hi friends of Christina! Isn’t she lovely? I miss her TONS and cannot wait to see her again when I go back to St. Louis this summer. If you know me at all, you know I am addicted to giving things away. It’s sooooo fun :-) I have rounded up all of the current giveaways I know about that will be happening in the next two weeks and added a few of my own. 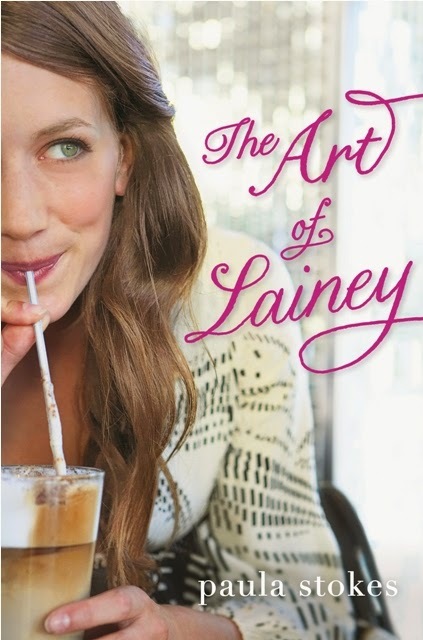 May 6th is the LAST DAY you can enter to win an ARC of The Art of Lainey on Goodreads. Jess at Reading Nook Reviews is giving away a signed finished copy of the book, a second book, and a cool soccer necklace. Enter here! This contest will run until May 17th. Wendy is giving away a signed finished copy of the book on The Midnight Garden. This contest will run until May 19th. 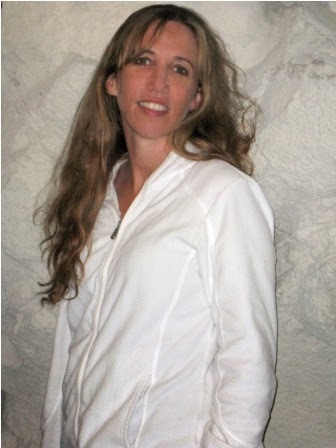 Jen at the Starry-Eyed Revue says: "This is the novel that young women need to read: to experience Lainey's determination, to be inspired by a friendship that stands the test of time, to realize that they are not alone in their heartbreak and that it does get better, and to open their eyes to possibilities and not limit themselves." Enter to win a copy here (INTL) before May 9th. I will give away at least one copy of the book between now and May 20th to someone on twitter who has The Art of Lainey cover as their twitter icon. I will be giving away at least one copy of the book to someone who has The Art of Lainey countdown widget in their blog sidebar. 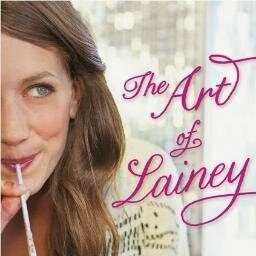 There will be multiple copies of The Art of Lainey up for grabs on both the US and Canada blog tours. Watch my twitter feed at @pstokesbooks for more info. And finally, I will be giving away three signed finished copies of the book, bundled in fun gift packs—the sporty summer pack, the coffee shop collection pack, and the fabulous fashion pack—as part of my twitter release party. 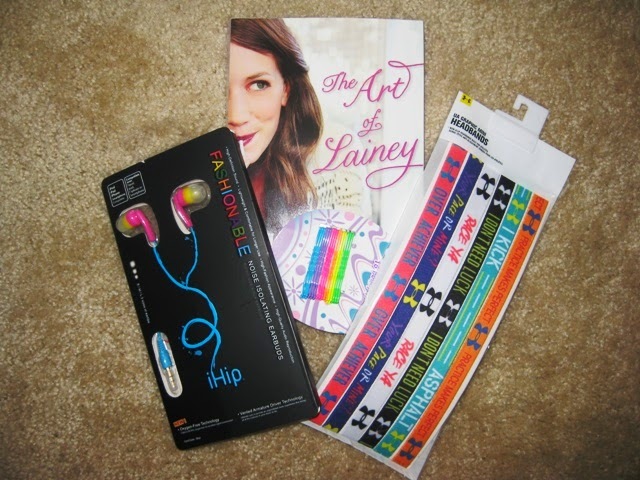 The sporty summer pack includes a copy of The Art of Lainey, some fun colored headbands and bobby pins so you can manage your own sometimes-unmanageable hair, and a pair of neon earbuds so you can rock out to favorite tunes while getting your sportiness on. 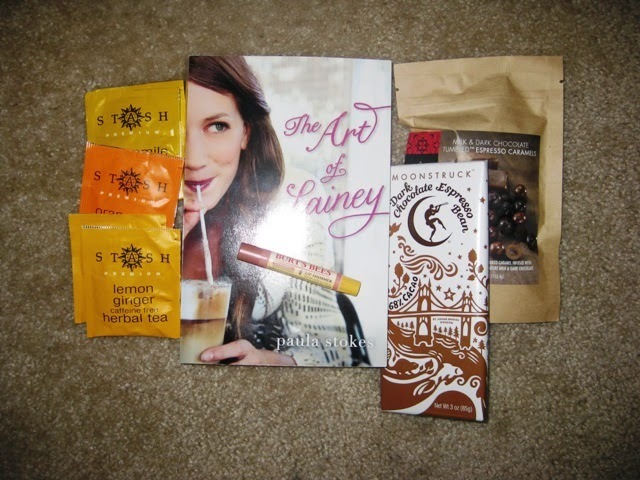 The coffee shop collection pack includes a copy of The Art of Lainey, some coffee-themed chocolate, a caramel-flavored Burt’s Bees lip gloss, and a selection of herbal teas. Feel free to rip open the tea bags and practice reading your leaves. Is that new love I see? The fab fashion pack includes a copy of The Art of Lainey, some sparkly headbands, glitter makeup, a nail art kit (+ a tropical file so you can dream of Costa Rica like Lainey), and his/hers lip balm, because when you are this fabulous, getting kissed is pretty much a guarantee. What twitter release party, you ask? I love me some twitter and I think it’s a fantastic place to celebrate a book release. So on May 20th, from 8pm to 9pm Eastern time. Christina and I will be throwing an epic twitter bash under the #ArtofLainey hashtag where you can come ask me your questions, win prize packs, and fight over Micah with all the other party attendees ;-) International people are welcome, however international prizes will be modified to orders from The Book Depository + signed swag/bookplate because I can’t afford to pay fifty bucks to mail twenty-five bucks worth of merchandise. After the party, just for fun, I’ll be watching one of Lainey’s favorite movies, Bend it Like Beckham, and live-tweeting under the #BendIt hashtag. But that’s not all! Once you read The Art of Lainey, there is a 99.2% chance that you will either fall madly in love with Micah or want to BE him, depending on your romantic preferences. So I have persuaded Micah (as well as Lainey and Bianca) to sign some postcards for me as part of the release celebration. The first 50 people (INT) who post honest (yes, you can absolutely skewer the book and still get a postcard if you like) reviews of the book on multiple review websites will receive a LAINEY postcard signed by me and the main characters. There will be a google form to fill out for this once the release date rolls around, but I just wanted to tantalize you with the promise of Micah’s scribbly boy signature for you to keep forever. This offer should IN NO WAY be construed as me trying to buy good reviews. I’ll read your reviews, but in the end some people will love the book, some will like it, and some will not. That’s kinda how it goes for all books, and I have more than made my peace with that. I care much more about the number of reviews my book receives than I do about a couple of tenths one way or another in the overall rating. Thanks to everyone out there who has posted, tweeted, or commented about THE ART OF LAINEY. Thanks in advance to anyone who makes the time to write a review. I am so excited to share this book with the whole world. So excited, you guys! I'm going to be first in line to buy the official book :-) I hope you guys will hang out with us!!! :-) And to start things off, I'm adding in a giveaway for a box of books from my bookshelf (US only) or Amazon GC for INT friends, and Lainey swag packs! 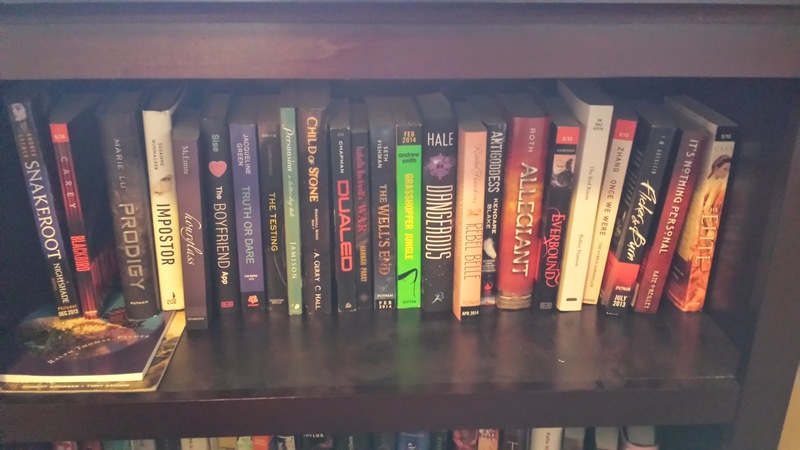 As usual, you can select one of the books that go in your box! The two tweet messages are DIFFERENT so please make note of that. I'll be checking when I select a winner! I LOVE THIS BOOK SO MUCH. Micah is my everything now. I can't wait to hold a finished copy in my hands and reread it. C--so now is today your birthday or tomorrow? :-) And you don't have to publish this comment if it's supposed to be a secret. I am so excited about his book! The more I read and see online, the more intrigued I become about Lainey! Thanks for the giveaway. Super excited for its upcoming release! Thinking about reading this makes me excited! I really want this book since the moment I laid my eyes on it. It sounds like my kind of read (I'm a sucker for contemp romance <3). Plus, everyone seems to love it--makes me excited even more! Ah! I borrowed an ARC of this book a few months? ago, and I can't wait for it to be released! I want to reread it so bad, I need more Micah! The book sounds amazing. I absolutely can't wait to meet the characters everyone is raving about!!! Thanks for the giveaway. Can't wait for May 20th! I've been super excited about this book since I heard about it. I can't wait for the release!! This book sounds pretty good, exciting giveaway! I've read so so so much about this book but I haven't had the chance to read it so I would really like this opportunity! <3 Thank you for this giveaway! This book looks really fun. Paula is great. Can't wait to read! This looks so fun! Paula's books are always great. Can't wait to read! Honestly , the book. Or maybe the coffee. The fashion pack loos awesome too. Thanks for being so generous! The 'Fab Fashion pack' looks amazing!! I am SO excited about this book and brilliant giveaway. I can't wait for the Twitter party! I love this book, and I'm so happy for Paula that so many readers are excited about Lainey! Love the COFFEE SHOP COLLECTION PACK. Yum. Sounds like a great read. Thanks for this great giveaway! Can't wait to read. Yay box of books! The Coffee Shop Collection Pack sounds awesome. All of the packs are so awesome :) Thank you for the chance to win! I'd love to read this one. Been excited for it for awhile now. I would love to win! I've seen the book everywhere! So so exciting! All of the packs a great :-) Can't wait for the twitter party! I'm just so excited to read this book in general. A friend loaned me her ARC this past weekend, so I can't wait to (hopefully) add my praises to all the ones already voiced. Thanks for the giveaway! I'm don't read comtemps usually but this looks so cute I really want to read it it seems like the prefect Segway for me. I've been hearing about this book since it was launched. I'm really excited to read it. The Fab Fashion pack looks fabulous. The Book, Coffee, or Fashion Pack! Totally Awesome! The Sporty pack looks BRILILIANT!!! Great giveaway, thank you!! !